When I saw the yards of black gingham, something tapped me on the shoulder. Peaked my attention. Made me pause. And I wasn't sure why, save for maybe last fall's intention to adopt the goal of having well-made, ethically made, finer garments in my wardrobe. Yes, it was something to do with that, I was sure, because part of that intention hinged on me making more of my own, which felt both incredibly liberating and overwhelming. So many patterns out there, so much fabric, but not very much of the right fabric, it seemed. Baby steps. Sometimes more like a shuffle. But still, movement toward a goal by inches or even halves is still movement. Still something, I realized. So, I made a plan, gave myself steps so I wouldn't lose my way. 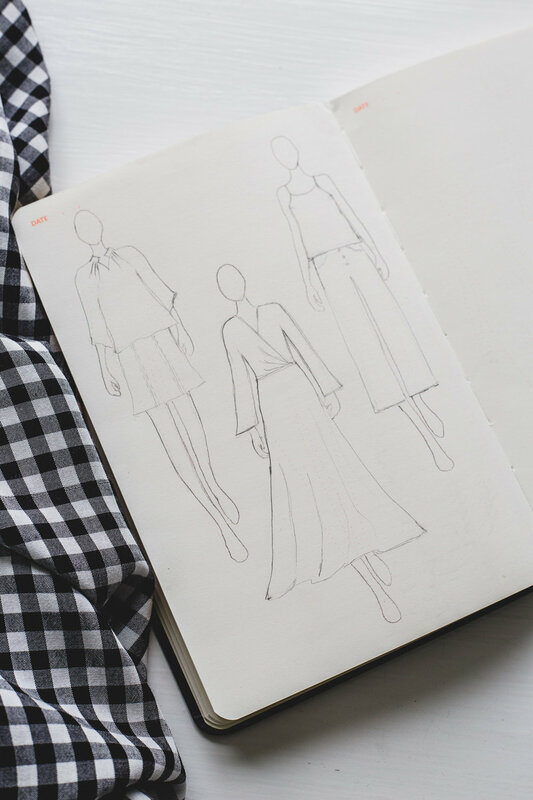 It began with a new Pinterest board labeled Wardrobe, created for the sole purpose of curating sewing patterns that are unequivocally me. Then, I gathered help. Help in the form of a sketch book, and allotted time, and an experienced garment sewist, who's also my friend. The sketchbook is the Fashionary Sketchbook from Fringe Supply Co., the time is Sundays, the friend is Rosie. Not that I couldn't embark on my own, leaning on my so-far experience, but it occurred to me that I could set myself up for even better success if I fell in step with someone who has such things as wedding gowns and theater costuming in her repertoire. We could both pretend that I knew nothing, so I would end up knowing more that I ever had before. A layering on of skill. So, that black gingham fabric? Why did it pull me aside that day? Because of this. This image that I'd pinned who knows when, but just found again when I was busy with this week's earlier task. My breath caught when I saw it. So elegant, so simple, so beautiful. Totally unplanned, but a fun surprise that this post landed during Fashion Revolution week!